As part of the move into the newly developed Southmead Hospital building, Fresh Arts held a Speed Derby competition to engage staff from across North Bristol NHS Trust. Bristol-based artists Assemble and Join led the project, creating a custom-built track for the Brunel Building at Southmead, which would host the big final race during the Fresh Arts Festival in 2014. 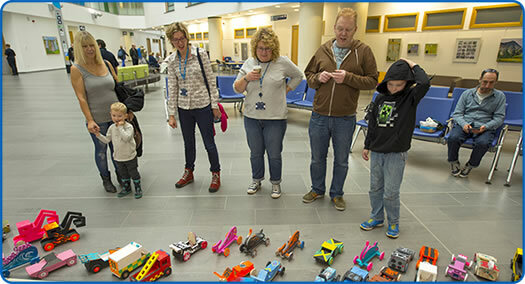 Staff were invited to take part in building their own creative cars to race, assembled from pre-cut pieces inspired by vehicles and equipment seen around the old Southmead & Frenchay hospital sites. At the end of each workshop a mini-derby race was held and each car timed. The winners and the top times then went on to race in the Grand Final. Staff were encouraged to build and compete in teams, connecting with the new site and to get to know new colleagues who they would be working with in the new hospital. Following the final the track was donated to Stoke Park Schools for the school and local community to enjoy.